The Paris-Malakoff Séjours & Affaires extended stay hotel is located in an attractive town known for its great quality of life: with many shops, large public facilities, a rich cultural and community life. 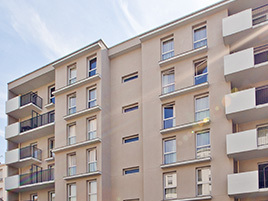 The aparthotel benefits from a great environment on the outskirts of Paris, near the city center, and close to the metro that will connect you to the center of the capital in a few minutes. You will discover the richness and diversity of Malakoff's architectural heritage with its many villas, paths, alleys, and other passageways that give it a rural air that everyone enjoys.You will have the opportunity to relax in the shade of the striking tall trees in Léon Salagnac Park. Finally, you can easily get to the Porte de Versailles, where many trade fairs are held or even to Roland Garros for tennis lovers and fans. The aparthotel has 78 studios with a double bed or twin beds, a fully-equipped kitchen (hotplates, refrigerator, microwave oven and dishes), an office area, a bathroom, and an LCD television. It is located in a courtyard and has a view of two gardens in a quiet setting.